Time’s not a luxury all of us have. Add to that the additional stress of asking for leave. Yes, we hear you. Just pack your walking shoes, an appetite and a spirit of adventure, and hit up these destinations that are totally doable – even if you’ve only got two days free. Of course, the world opens up a gazillion opportunities if you combine it with a Friday or Monday off, but either way, you can attempt these even if the weekend’s your only recourse to making that mini-vacay happen. Tiger spotting (or bird-watching, maybe) is always a good idea, and you can get all the necessary information on the national park's website. Refer to our list of eco-resorts in the area when you’re picking a place to dump your stuff. This riverside property looks gorgeous if you have more salary left in your bank account. Hotels not your scene? This homestay with a rustic Finnish sauna, the friendliest doggos and a cafe that overlooks a farm, has our vote. We know a certain colleague who runs to her Doon house over the weekend just to cuddle her dogs. She either takes an early morning train (6:45 Shatabdi) or hitches a ride, which gets her home sooner (about a 4.5 hour long drive). To make sure you squeeze in everything fun, she chalked out a full-day itinerary including where you could stay, the sweetest cafes to sip coffee, a quaint pub to enjoy a night gig and every tourist spot (how nice is this monastery?!) worth its salt. This design-space-turned-cafe has a piece of our heart. 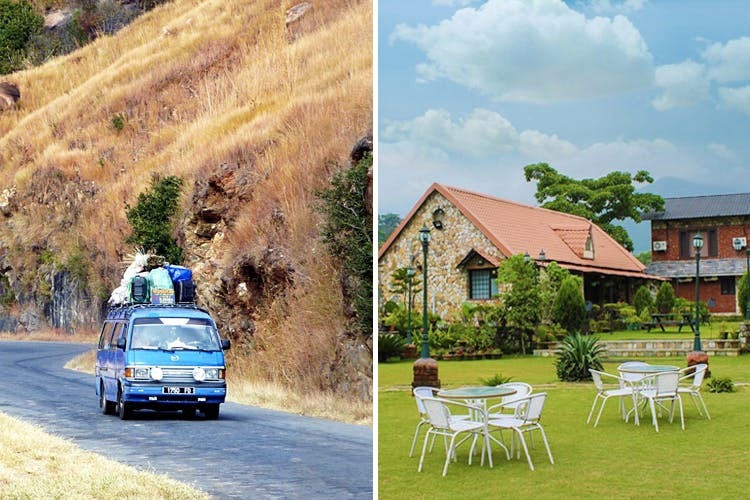 Cafe Marigold and Chhaya are our favourite haunts and, if we were you, we’d love to stay at Riverstone Cottages to enjoy looking at the river all day. Begin by booking yourself into one of these beautiful resorts in Rishikesh. Broke travellers, this hostel is where you need to kick back to ensure you still have enough for takeaway pizzas when you’re back in Delhi. Bungee-jumping, river-rafting or camping with the gang will make sure that your trip has the right mix of adventure thrown in. If you’ve got just the one day, you might as well pack in all the fun stuff, right? For mid-meal/post-adventure breaks, find yourself a nice spot at this cafe to continue river-gazing (and coffee guzzling). The pink city is a no-brainer when we’re looking for quick getaways. Your options are to either take a late evening Volvo, or drive down early on a Saturday. Once there, you’ll be surprised at how much you can do. From a mind-boggling number of pretty cafes to its bustling bazaars and the delectable street food (hello, pyaaz kachori and thick-as-hell MI Road lassi). You can choose to stay at one of our favourite AirBnBs. If you still have doubts, you can refer to this handy one-day guide. Jaipur seems like too much effort? You can still make it to Alila Fort and enjoy candle-lit dinners and a stunning bird’s-eye view of the city; it’s a little less than a five-hour drive from Delhi. This is as close as we can get to the hills without killing ourselves driving. It helps that the cantonment town is quiet through the week, and holds out the promise of bun samosas at the end of every trek. If you can’t pull some strings and stay at the Kasauli Club, we suggest Baikunth Resorts for its comfortable rooms and views (and relatively fewer monkeys). We head to the tiny heritage market for an evening walk, no matter how many days we’re there for. Once we’re here, we have our coffee at Old Town Cafe. If we have more time, we even explore the town’s oldest churches. Your lunch has to be at The Ross Common Hotel, it’s full of feel-good sunshine and bursts of cool valley winds (their Indian khaana is yum!). Even if you don’t have the patience to spot birds (we don’t blame you), the fact that this national park is so close to the city (only about an hour away) makes it one of the best bets. If you’re vacationing with the fam, this resort with adventure activities, friendly farm animals and pottery classes, is perfect. Don’t underestimate Faridabad and its nearabouts. There’s Vivanta By Taj, where a lot of folks we know just head over for a staycation that doesn’t involve a taxing drive, or a tedious train and bus journey. When the weather gets better, you can hop over to Camp Dhauj for rock-climbing, nature walks or zorbing. This rustic retreat (that champions the cause of sustainability and comes with a pool) is where we intend on bunking. Animal lovers, look no further from this feel-good animal farm that lets you spend a whole day around four-legged beings, combined with farm activities. P.S. Craving a dose of history and culture? How about this jewellery museum and eco-lodge?